Rated the #1 party favor among guests, a photo booth provides a fun supplement to traditional photography. a wide array of props make photo booths a perfect way to enhance your event and capture special moments. 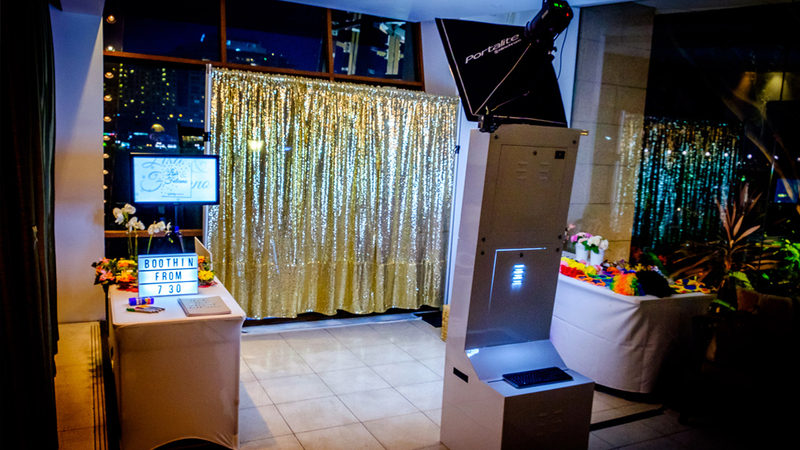 We offer two basic photo booth configurations, an Enclosed booth or an Open Air booth. Depending on your requirements, any booth can be customized and decorated to match your decor. Our booth will be welcoming for guests, while non-invasive to your event. To give your photos that wow factor, it's important to choose the right backdrop for your event. Backdrops provide the setting for the photos and can be formal, flashy, subtle or plain. Below is a sample of some of the backdrops available that can be added to any package. We also provide custom printed backdrops for corporate functions or clients needing step and repeat setups. Guests are able to let their creativity flow by choosing from a variety of costumes and props. We offer themed props for most events; We also offer custom printed props and signs for those unique events. Give your guests the opportunity to showcase their imagination! Immediately after taking the photos, the guests will receive a professional quality print of their photos. As the host, you have the ability to choose a layout for your event's print. You can choose the theme and any words/phrases or logos for the finished print layout. A Photo Booth by us will be one of the highlights of the night, let us help you make your event one to remember! If you are looking to hire a photo booth that is unique, fun & awesome... Then you have come to the right place! We offer personalized packages, the most technologically advanced booths, professional staff and affordable rates. We are the professional choice for a unique and memorable Photo Booth experience. We can provide photo booth services for Macon, Warner Robins, Perry, Byron, Bonaire, Forsyth, Dublin, Milledgeville, Albany, and the Middle Georgia area. Specializing in services for weddings, schools, corporate, private events, sweet 16s and more.